What a year it was in the Catskills. New restaurants, breweries and other food and drink businesses opened their doors from Woodstock to Hancock and across the Greene County mountaintops. National retail chain Target put Catskill-grown produce in nearly 2,000 stores. The Town of Neversink served its first cocktail in 80 years. We got a drive-in movie theater whose concession-stand treats (and libations) are all produced locally. Catskill cheeses garnered national attention. New York City chefs came north to cook closer to their ingredients, while local chefs and farmers continued to demonstrate how to build restaurants around that idea. In addition to an onslaught of brand-new eateries of all stripes, new owners revived and revitalized several long-dormant iconic Catskills restaurants: Youngsville’s Clair Inn & Cafe, Tannersville’s former Smiley’s Ice Cream (now Mama’s Boy’s Burgers), Delhi’s Meredith Inn and the restaurant at Point Lookout near Windham, just to name a few. Meanwhile, in one of the most-read Catskill Eats stories of 2015, celebrity pastry chef and reality food show star Johnny Iuzzini, a Catskills native, shared his plans to open a large chocolate and coffee factory in Sullivan County. It was also a great year for local-foods retailers, particularly in Delaware County, which saw the reopening of the Andes General Store under new ownership by Argyle Farms and the launch of Gone Local in Franklin. In Margaretville, Stick in the Mud celebrated a soft opening (and a celebrity visit from actor Adam Driver) over the holidays, and plans to expand into a full-blown retail shop and cafe in the coming months. Major media outlets took notice, publishing multiple high-profile stories covering the region’s culinary tourism attractions. Real Simple, a national magazine, turned eight Catskills farmers and restaurateurs into fashion models, thrusting local food (and local Jersey cows) into the spotlight. The New York Times’ T Magazine, Food & Wine, Newsday and New York Magazine all weighed in. TV wasn’t far behind: A Roscoe pasta maker and a Delhi sausage-maker were featured on a new Food Network show. 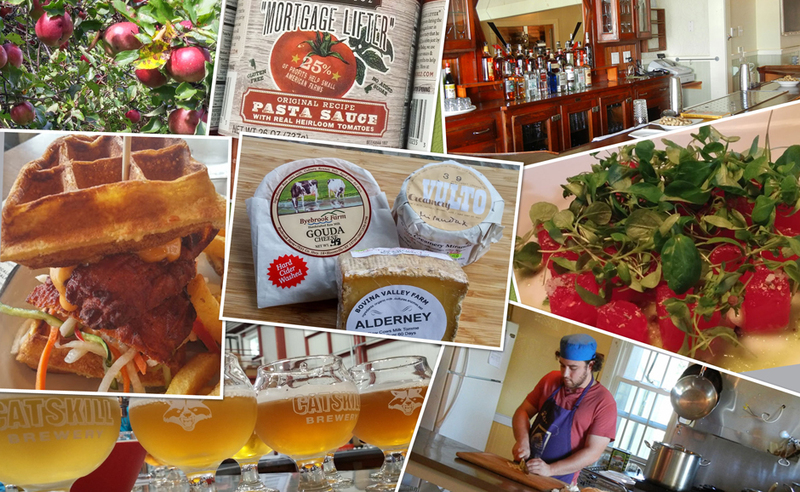 There was a lot of talk about how 2015 was “The Year of the Catskills.” But from Catskill Eats HQ, it sure looks like 2016 will be even bigger. The new year started off with a bang. Our story this week about Manhattan’s 212 Brewing Company building its headquarters on a former horse farm in Delaware County quickly became Catskill Eats’ most-read and most-shared story. First of all, the 2016 calendar is filling up with events celebrating Catskills food, drink and farms — many long-beloved, along with plenty of newcomers. The Narrowsburg Honey Bee Festival returns after a wildly successful inaugural run last year, while Fleischmanns hosts the first Great Catskill Mountain BBQ Fest. A new restaurant from the Phoenicia Diner team, slated for the former Gyspy Wolf Cantina space (Woodstock). And while it’s anything but new after 30 years in business, the planned May reopening of Sweet Sue’s pancake house in Phoenicia might be the most anticipated restaurant news of 2016. On the beverage front, the Catskills’ inventory of breweries, cideries and distilleries is skyrocketing, as is the number of places to enjoy their products, from a new wine bar and a new brewpub in Windham to a tasting room in Tannersville. Ulster County’s New Paltz Brewing expanded to bigger space in Wawarsing, while Delaware County’s Awestruck Ciders moved from Walton to Sidney after outgrowing its original digs. The coming months promise more growth and expansion. In addition to 212 Brewing Company setting up shop in Bloomville, several other big projects are expected to launch in the next 12 months. They include: Union Grove Distillery, inching toward its opening date in Arkville; Claryville Brewing Co., part of the Claryville Center complex; and a new brewery on Route 28 in Ulster County, tentatively titled Shokan Brewing Co.
For Catskills residents and visitors who care about where their food comes from, 2016 promises to be another great year. Stay tuned for new developments — and thanks for reading.